Over the last decade, social media services had an enormous impact on modern culture. They are nowadays widely established in everyday life, but also during natural and manmade crises and conflicts. For instance, Facebook was part of the Arabic Spring, in which the tool facilitated the communication and interaction between participants of political protests. On the contrary, terrorists may recruit new members and disseminate ideologies, and social bots may influence social and political processes. Based on the notions of cultural violence and cultural peace as well as the phenomena of fake news, terrorism and social bots, this exploratory review firstly presents human cultural interventions in social media (e.g. dissemination of fake news and terroristic propaganda) and respective countermeasures (e.g. fake news detection and counter-narratives). Secondly, it discusses automatic cultural interventions realised via social bots (e.g. astroturfing, misdirection and smoke screening) and countermeasures (e.g. crowdsourcing and social bot detection). 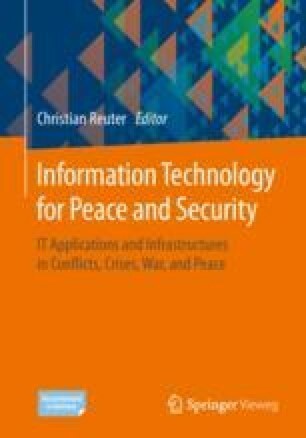 Finally, this chapter concludes with a range of cultural interventions and information and communication technology (ICT) in terms of actors and intentions to identify future research potential for supporting situational assessments during conflicts. Cheong, M., & Lee, V. C. S. (2011). A microblogging-based approach to terrorism informatics: Exploration and chronicling civilian sentiment and response to terrorism events via Twitter. Information Systems Frontiers, 13(1), 45–59. https://doi.org/10.1007/s10796-010-9273-x.